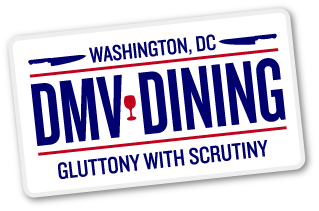 Let’s face the facts: it’s slim pickings when it comes to casual dining venues near the Kennedy Center and the adjacent Watergate complex. That is until Campono, Bob Kinkead’s fast-casual pizzeria and sandwich shop, recently opened less than two months ago. Situated next to the James Beard award-winning chef’s full-service restaurant, Ancora (which is now closed for renovations and aims to reopen in September), Campono’s main attraction is its outstanding wood-fired pizzas. We were recently invited to sample Kinkead’s casual Italian eatery and left very impressed. 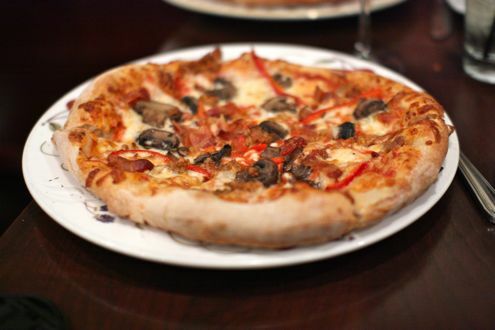 Campono is serving up some seriously good pizza, and we’re here to get the good word out. The restaurant is setup like an upscale cafeteria, where diners place their orders and pay at the counter while they wait for their made-to-order food to be served at their table. 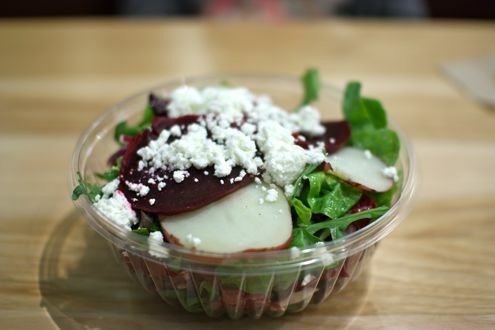 Salads are served in plastic bowls, beverages in Styrofoam cups, an abundance of plastic utensils… you get the idea. 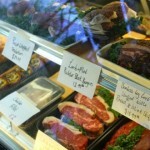 But don’t let the disposable flatware dissuade you from the cooking because Campono is not your typical downtown DC deli. We started the evening off with their beet and goat cheese salad. Topped with fresh crumbles of goat cheese, the salad was very good, though Campono might want to implement better containers for those that opt to dine-in versus carryout. The stars of the show, however, were the pizzas. Employing natural yeast biga (starter) and ’00” flour dough, the hand-rolled pies are cooked in a wood-fired oven at 800 degrees. The menu is divided between Rosso (tomato sauce) and Bianca (white pizza), so we tried one of each. The first pizza we sampled was the L’Aquila. 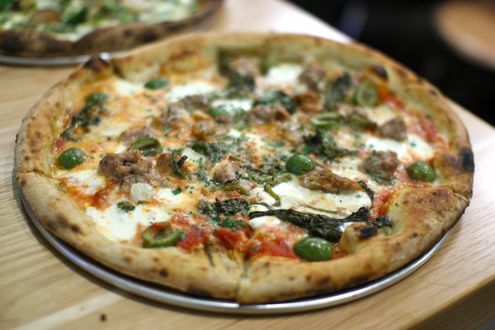 Prepared with housemade Italian sausage, broccoli rabe, mozzarella, and olives, the crust was crisp on the outside and soft in the middle without being overly chewy while the toppings were incredibly fresh and robust. And while it was more expensive than other options (pizzas range from $9 to $15), this is plenty of pizza for two people. The same could be said for the Primavera. 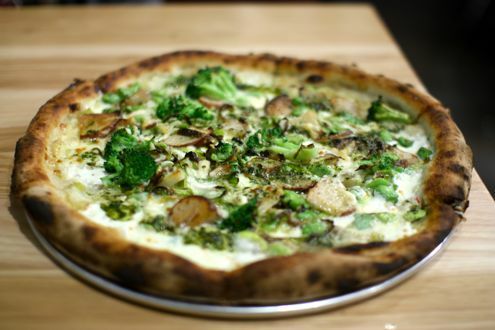 Topped with asparagus, favas, broccoli, leak cream, parsley, scallions, and a mozzarella blend, this is not your classic white pizza. But that’s a good thing as this was a terrific, unique combination of ingredients. Rachel enjoyed this one more while I preferred the former. 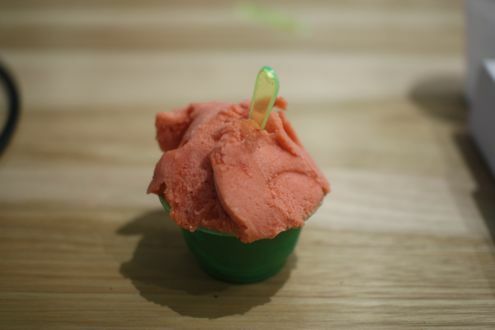 Make sure to leave some room for dessert as Campono makes all of its gelato daily in-house. The two scoops of mocha almond and strawberry sorbet made for an excellent duo of flavors and a sweet ending to a great dinner. While there’s plenty of good pizza to be had in the District, Campono officially has the Foggy Bottom area on lockdown. I don’t even know how to begin with this post other than saying I am completely in love with this place. 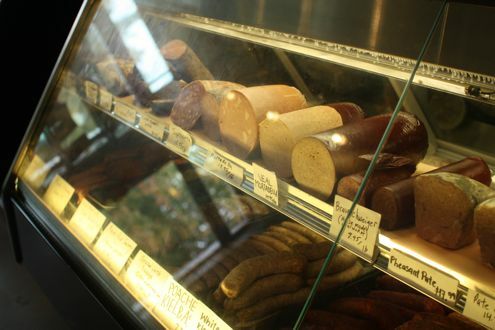 Tucked away on a quiet corner of Georgetown, Stachowski Market & Deli is a meat-lovers dream. 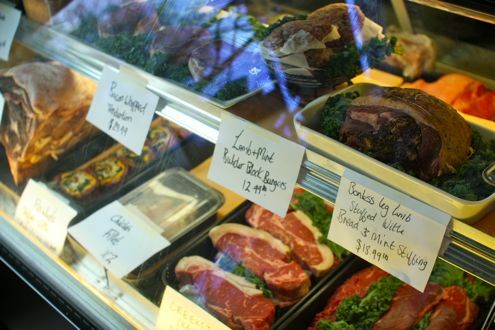 When you step inside the market, a table of locally-grown produce is situated in the center of the room while two cases in the back of the house a plethora of locally-sourced meats, ranging from cocoa-rubbed capicola to fresh duck sausage to dry-aged steaks. 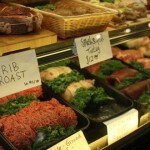 My eyes lit up analyzing the variety of meats Stachowski had on display. 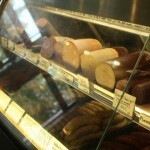 On top of that, they also offer a deli counter serving up ten or so sandwiches. Based on a tip from DC sandwich guru Jack Kogod, I ordered the pastrami. Let me go on the record and say that this was the best pastrami sandwich of my life. I try to defer from using such hyperbole, but let me tell you, this sandwich was no joke. Meanwhile, Rachel ordered a more manageable sandwich with the Butcher Shop Dip, which was also $11.99. 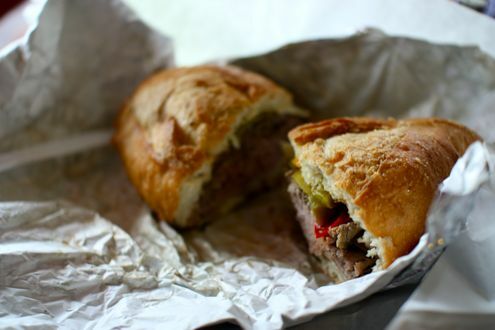 Packed with warm roast beef, provolone, hot peppers, jous, and served on a mini baguette, this sandwich was, just like the pastrami, enough for two people and just as enjoyable (though the pastrami gets a slight edge because, well, I just love pastrami – especially if it’s hot and smoky). On top of that, we also ordered two patties of their “smash and grill” turkey burgers to-go. We grilled them up on the grill pan the following evening and were mutually impressed by how fresh and flavorful they were. These were restaurant-quality turkey burgers and made for a great “home-cooked” meal. And for $6.99 per pound, it was a quality purchase. 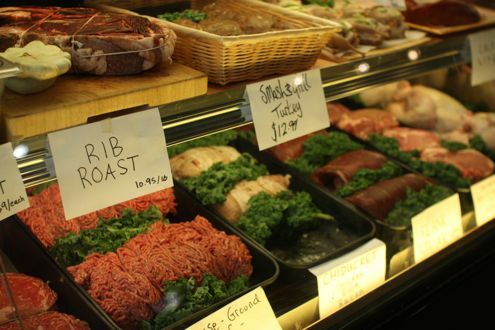 On top of Stachowski’s sausage, steak, and charcuterie selections, they also offer prepared dinners which typically range from $13 to $16. Take, for example, “chiduckon” – chicken breast and duck breast wrapped in bacon. That pretty much sounds like the most amazing thing, ever. So yeah, we’re big fans of this place and we have only been once. We can’t wait to go again. Given that my office is a stone’s throw from Bethesda Row, it’s no wonder that I don’t venture as often as I’d like to the other side of Woodmont Avenue. There are lots of great places to choose from, but it involves a ten to fifteen minute walk, so you have to factor that (as well as the weather) into your plans. Today was a perfect day for a walk, so I met a friend over at Jetties for lunch. 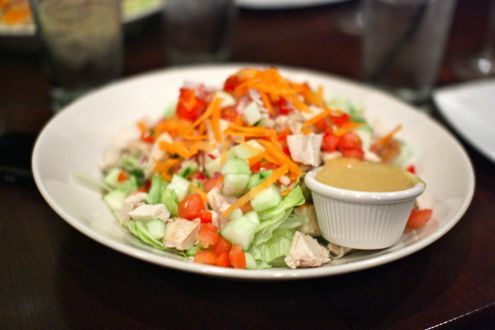 Less than a year old, Jetties has quickly gained popularity as another sandwich and salad option for the lunch crowd in Bethesda. 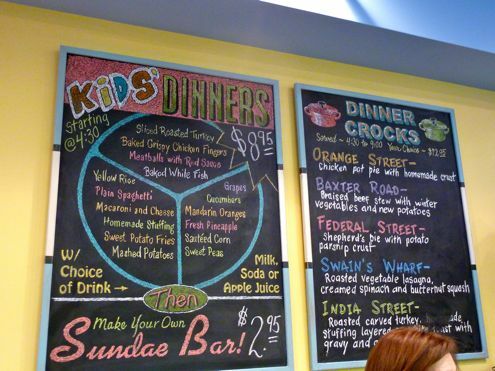 They offer a dinner menu too, but you could tell that lunch really draws the crowds. 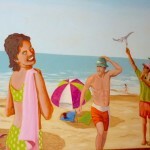 Between the beach decor and signs on the wall, there is some sensory overload when you walk in. We walked in and were a little confused by the line as there were several areas of people gathered, whether it was to write down their order, order at the counter, or wait for their order to be called. 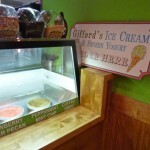 There is also a separate line for ordered desserts from Something Sweet as well as ice cream from Gifford’s. We made our way to the cashier and quickly decided on one of the specialty sandwiches. I decided on the Nobadeer… essentially thanksgiving dinner on bread. 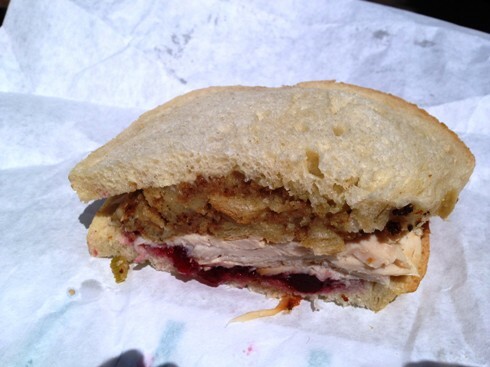 The sandwich came with fresh-carved turkey, stuffing, and cranberry sauce with some mayo on sourdough bread. Given that I can’t have regular deli meat (damn nitrates), this was right up my alley. My friend Todd got the Cisco which also looked delicious. I went for my own Arnold Palmer version of their fresh lemonade and fresh brewed tea as it was great to sip on while sitting outside. There aren’t a lot of tables inside Jetties itself, but there is a lot of seating outside between their own tables in addition to the public ones around Woodmont Triangle. We sat outside and enjoyed our sandwiches while taking part in some great people watching. My sandwich was delicious and huge. I only ate half but was skeptical how the rest would hold up for later. I loved how everything tasted together, but expected the turkey itself to be hot. Instead, it was a little warm because of the layer of stuffing, but it still tasted great. The only thing I will say is the cranberry sauce made the bread a little soggy, and maybe heartier bread would have held up better with all the ingredients. At $8.95, this was by no means a cheap sandwich, but then again, it’s pretty hard these days to find a lunch option in Bethesda for less than $10 unless you want Subway, which obviously pales in comparison to anything you’ll find at Jetties. I was recently in Pittsburgh for a few days for a conference and figured I should try to make the most of it by checking out some food establishments that are quintessential to the city. Based on the suggestions I received from friends as well as from the exposure from Man vs. Food on the Travel Channel, I knew the one place I had to check out was Primanti Brothers. It wound up being my last stop before the airport and definitely the most memorable. 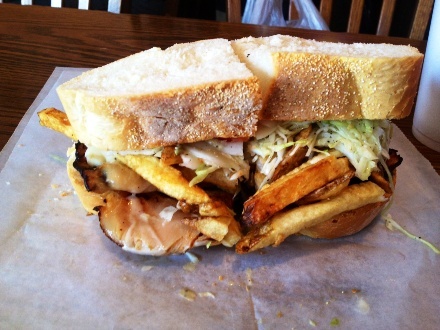 There are several Primanti Brothers locations throughout the metropolitan area, with the original being in the Strip District. I went inside and sat myself after a friendly employee asked if I was expecting anyone else. Staring right at me was the famous menu. Each sandwich comes with lettuce, tomato, coleslaw, and French fries. That’s right, what you would normally find as sides on your plate are actually on the sandwich. I guess the thinking is that it saves time for a quick lunch break as well as not having to use a fork. 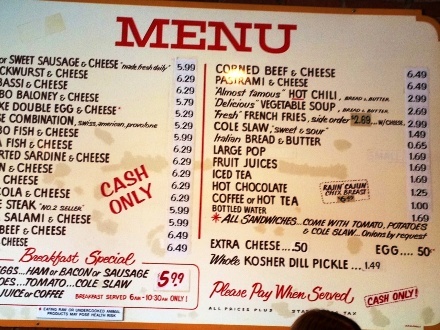 All items are cash only, with no sandwich costing more than $6.49. I opted for what I thought was the “healthiest” option and got the turkey and cheese sandwich. When it came, I was blown away by how quickly it arrived as well as the sheer size of it. It’s a shame my DMV Dining partner in crime wasn’t with me because he certainly would have enjoyed this experience. The thick white bread held the ingredients together without getting soggy. The turkey was smoked and had a nice char to it. I thought the fries would be too much but it actually wasn’t. Combining the melted cheese, turkey, fries, and vinegar-based coleslaw with lettuce and tomato led to one perfect bite. And then another. And another. I had to literally step away from the sandwich to avoid eating the whole thing. I have to admit, I was a little skeptical if Primanti Brothers would live up to the hype. 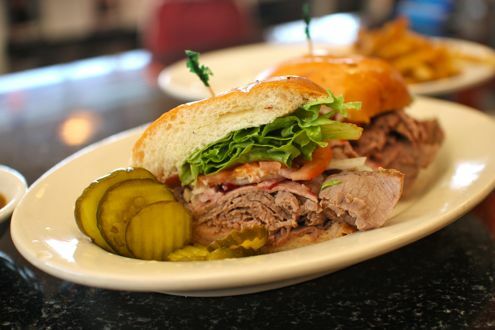 After trying one of their countless varieties of sandwiches I can say that it is definitely a must-visit in Pittsburgh, like Ben’s in DC or Oklahoma Joe’s in Kansas City. I don’t know when I’ll be back there, but when I do, it’ll definitely be on the list so I can revisit that delicious sandwich. We have already talked about several food trucks that primarily travel around Montgomery County, so I was lucky enough to try the newest entrant to the field, Corned Beef King. 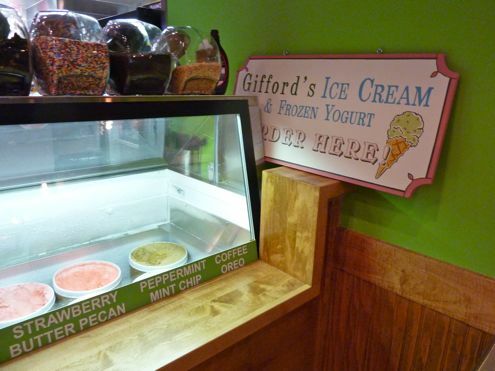 After being in business less than a week, they decided to make their debut in downtown Bethesda a few days ago. 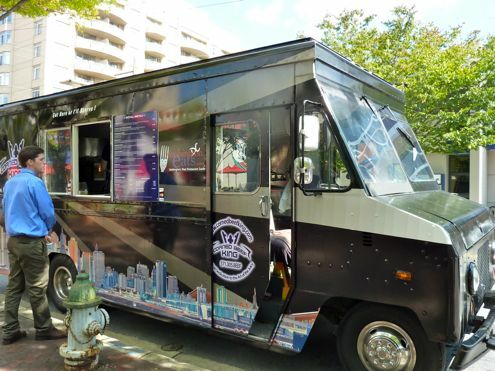 We caught up with them right at Woodmont Triangle, a perfect location for the lunch crowd. 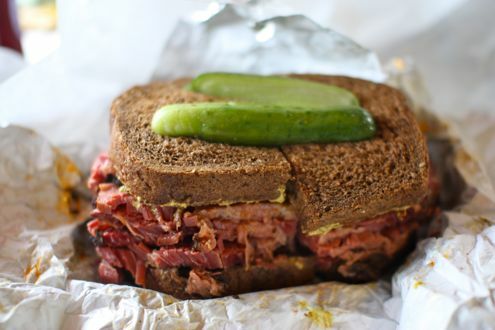 Their focus is on slow-roasted corned beef and pastrami, and they also serve specialty sandwiches such as the classic Reuben, a vegetarian Reuben, the Manhattan, and the Milly Ann. If sandwiches with one-third of a pound of meat aren’t enough to satisfy your hunger come lunch time, combos are also available that include sides such as potato salad, knish, coleslaw, or chips. Of course, you got to have a Dr. Brown’s to complete your meal, and I happily ordered a corned beef on rye sandwich with a diet Dr. Brown’s cream soda. I’m generally not a huge corned beef person, but I figured I had to order the company’s namesake. And let me just say, it lived up to it. 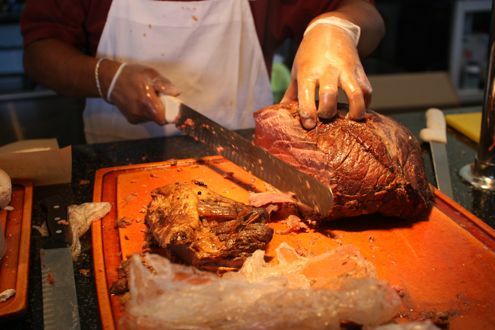 The corned beef was warm, juicy, and piled high on thick rye bread. It was such a big sandwich that I could only eat half, saving the other half for Brett. He enthusiastically seconded my thoughts on the sandwich, noting the generous amount of meat stacked in between the soft rye bread. 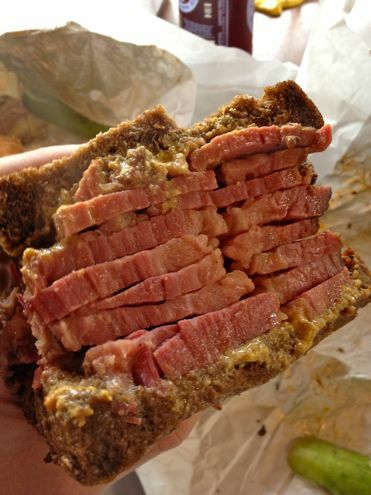 My friend Carlye ordered a hot pastrami sandwich, and after trying one bite I have to say, I think the pastrami might be even better than the corned beef. 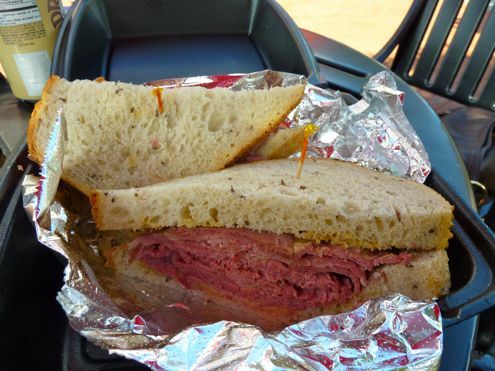 They were both excellent sandwiches, but the pastrami had a bit more flavor and zest to it. Needless to say, we are thrilled that there is a new food truck in town, and a quality one to boot. I can’t wait until it comes around again so I can try something else next time. The only downside is that I was in a bit of a food coma after lunch, but then again, it was definitely worth it! 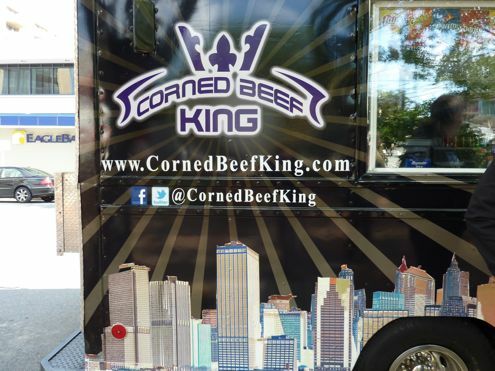 You can find out where Corned Beef King is parking its truck by following them at @cornedbeefking or by becoming a fan on their Facebook page. We already wrote about Food Wine and Company when they first opened last fall, and while the restaurant definitely had a promising start, we thought the food was just okay yet was lacking some direction. Clearly our hunch was right, as since that time Food Wine and Co. has been through several chefs and growing pains. One chef, the well-known Carole Greenwood, only made it 48 hours. 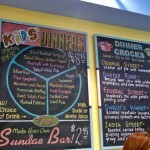 Since then, we have noticed great changes in the menu and offerings. Their new chef, Michael Harr (formerly of Butterfield 9), brings much experience with him that is clearly evident in his dishes and overall presentation. We have always enjoyed Food Wine and Co. and welcomed it as a much-needed replacement to the generic Pizzeria Uno’s. This past week was the first time I tried dinner there, and what better way to experience multiple dishes than during Restaurant Week. Since their happy hour is one of the best in Bethesda (in our humble opinion) we couldn’t resist enjoying some drinks at the bar first. While the place is called Food Wine and Co., we should note their extensive beer selection. It’s one of the best in Montgomery County, which isn’t easy to do given their alcohol restrictions. 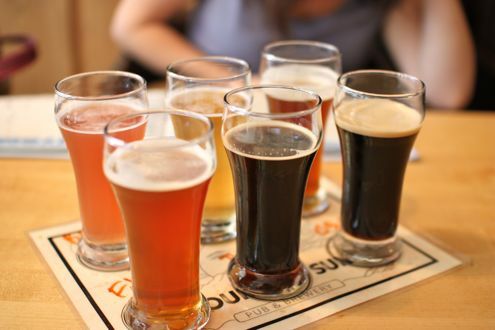 Even better, their happy hour menu includes both beer and wine flights for $9. 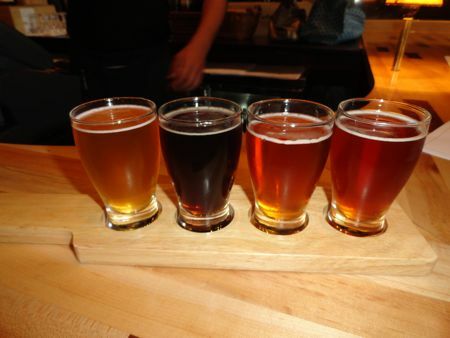 I decided to get the beer flight, which included any four draft beers in 4oz pours. It was a great way to try some new beers that I haven’t tasted before, and after finding one I really liked, I ordered a full draft which also happened to be on special. They also had dollar oysters, so you know we couldn’t pass that up. 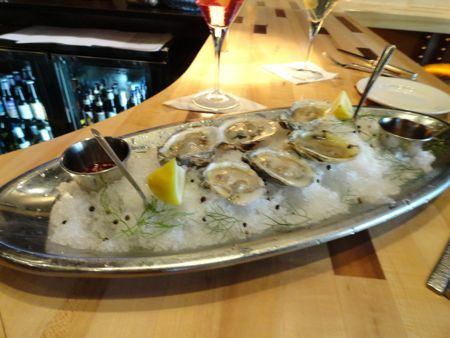 We tried a mixture of Blue Point, Rappahannock, and Old Salts, and I have to say, they really are some of the best oysters I’ve tried recently, and at a dollar a piece no less! Happy with our drinks and oysters, we made our way to the dining area for our reservation. I should point out that they did offer a fairly extensive menu for Restaurant Week. It wasn’t the complete menu, but it wasn’t just three entrees either. After some debate, I decided on the watermelon and tomato gazpacho with ricotta. 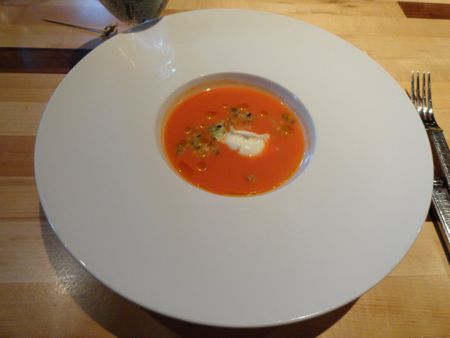 It was light and refreshing, but not too chunky or heavy like some gazpacho dishes I have had. In fact, I had one earlier that day at Assaggi and you couldn’t even compare the two in terms of quality. The main courses included everything from pizza to salads to sandwiches to mussels, as well as full entrees. 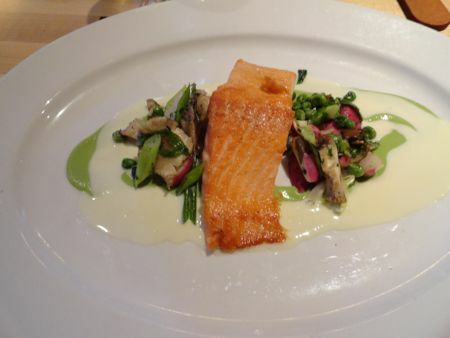 I figured I might as well try one of their pricier selections, so I ordered the salmon with English peas, alba mushrooms, radishes, and a horseradish cream sauce. It was perfectly cooked, seared on the outside while medium rare on the inside. The vegetables that accompanied the salmon were so fresh that I felt like I was tasting part of summer. I was really happy with my dish but tried not to eat it all so I could save some room for dessert. We decided to each pick a different dessert so we could try a few different ones. I ordered the Coconut Joy while my friends got the double chocolate bread pudding and the Elvis. I have to admit, I definitely had some food envy when I tried theirs. 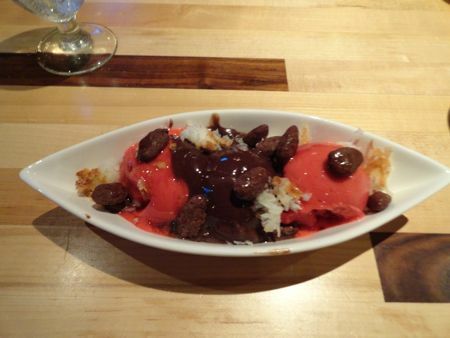 Mine was good, but it was originally supposed to have coconut and chocolate sorbet along with coconut macaroons, chocolate almonds, and rum syrup. Turns out they were out of the coconut sorbet and substituted it with raspberry instead. 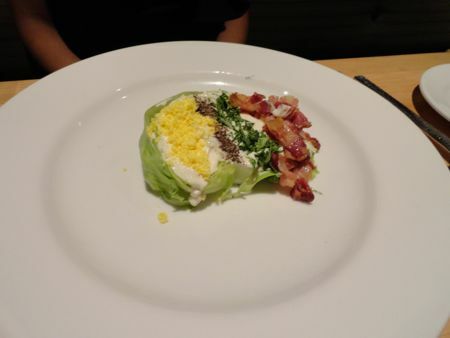 It was still decent, but it didn’t even compare to my friends’ dishes. I would order the Elvis next time – peanut butter and chocolate ice cream, fudge crispies, sweet and salty peanuts, bananas and chocolate sauce. The bread pudding was to die for as well. And considering that I work in the same building as this restaurant, there will be many next times. I may have forgotten to mention that before, but Food Wine definitely isn’t a bad place to work right above! Maybe we can get a discount for being neighbors? Last week I had the pleasure of being in Colorado for a conference, and Brett and I went out a day early to check out Boulder before heading to Denver. We knew we wanted to hit up a brewery or two, and first on our list was Mountain Sun Pub and Brewery as it earned high marks on BeerAdvocate for both its food and beer selections. We walked in and were seated right away in this welcoming brewpub. 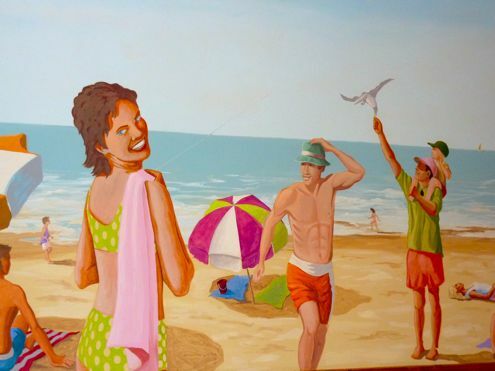 The walls were brightly covered with paintings for sale, and there were board games behind us if we wanted to play while we waited. We immediately decided we would try the six beer sampler where we could choose any six of their selections for $10.50. We went with the Java Porter, Blackberry Wheat, Colorado Kind Ale, FYIPA, the Ginger Beer, and the Stout. They were all great but I think our favorites were the ginger, the porter, and the blackberry wheat. We started our meal with a cup of their vegetarian black bean chili. It came with a side of corn chips and was not only delicious but also priced at a fantastic $2.95. From there, we each tried one of their daily specials. I ordered the Beet Lover’s Salad, which came with roasted beets, fresh farm greens, Bermuda onions, and a goat cheese sauce. 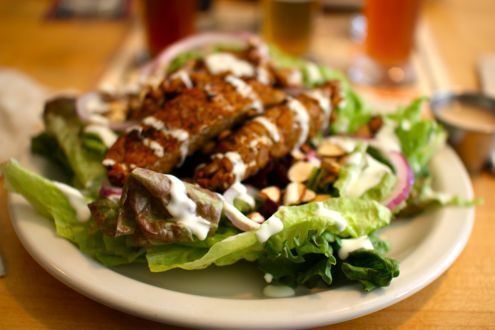 I added beer-baked tempeh to the salad, something I had only tried once before and was curious to have again. I wasn’t steered wrong, as it was a great, nutty addition to a nice summer salad. I’m a sucker for beets and goat cheese together, and this was filling but not overly heavy for a lunchtime meal. 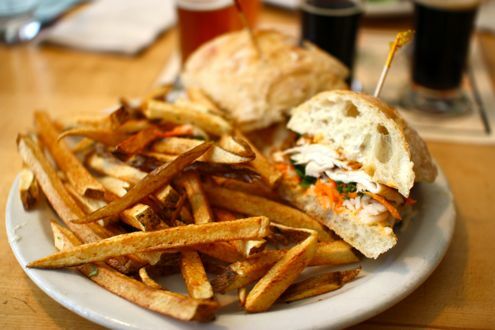 Brett got the Mountain Mi, a spin on a traditional banh mi sandwich. It featured marinated chicken breast, pickled carrots, dikon radish, sliced cucumbers, fresh jalapenos, cilantro, Thai basil, mint and sriracha mayonnaise, all served on ciabbatta bread. He clearly loved the sandwich after clearing his plate, and has been on a banh mi kick since. At one point a server came by and thought we had ordered a separate order of fries. We said we didn’t since Brett’s sandwich came with them, but he just left them anyway with us and didn’t charge for them. We certainly lucked out there since these were fresh-cut fries and highly addictive. We really loved this place, and not just for the food and beer but also for the great atmosphere, friendly people, and pleasant service. You could tell that this is a perfect venue in a college town, and we lamented that there wasn’t something even remotely close to this in College Park when we went there. We would definitely recommend Mountain Sun to anyone who happens to be in Boulder. Considering that there was a line for a table way past the lunch hour, this was clearly one of the city’s top local hangouts. Van Ness used to be a barren wasteland for restaurants, but with places like Comet, Acacia Bistro, and Jake’s American Grille bucking the trend, perhaps there is hope for this neighborhood after all. Rachel and I as well as a couple of our friends went out to Jake’s for dinner last week. We had been looking forward to dining there for quite some time given the expansive menu and diverse beer list, especially in a location where it is somewhat difficult to find both of these things in one setting. There is a relatively large bar area on the left side of the room which looks like it would be a great happy hour spot. In fact Jake’s offers two happy hours: 4pm to 7pm, Monday through Friday, and a drinks-only “reverse” happy hour from 9pm to close, Monday through Thursday. We were able to secure a table as soon as we arrived and were seated towards the front of the house. The interior gives off somewhat of a homey, neighborhood feel to it with its brick walls, wooden floors, and dim lighting. 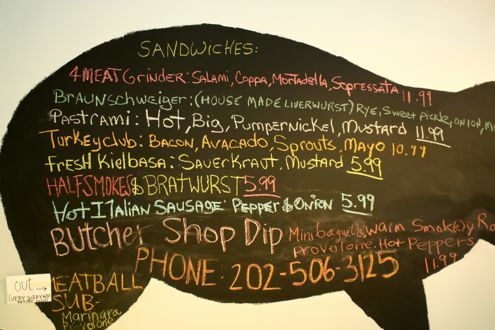 The menu primarily consists of tavern fare which featured an array of burgers, sandwiches, chicken, and fish. I went with the red curry yellowfin tuna while Rachel ordered the southwestern tilapia. When I ordered my tuna, the waiter didn’t ask for a cooking temperature, but assuming that the kitchen would cook it on the rare side anyway, I didn’t think much of it at the time. When the dish arrived, the tuna was definitely rare, if not a little undercooked. The parts of the fish that were cooked at the right temperature weren’t bad, but the quality of the tuna itself was just subpar. Considering that I have had similar dishes at other restaurants, I was slightly disappointed. 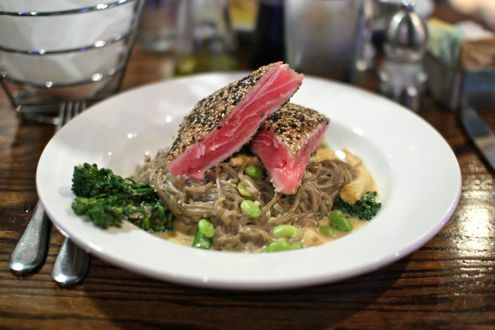 I did, however, enjoy the side of buckwheat soba noodles that featured baby corn, broccolini and edamame which was covered in a red curry-coconut sauce. 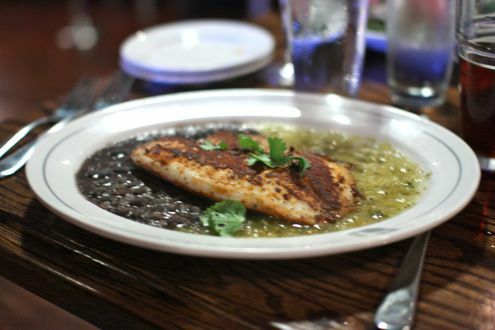 Rachel certainly liked her tilapia, but she felt that the dish was missing something as it only came with a side of black beans. It could have been accompanied with some sort of vegetable, rice, side salad, something! She put it best when she described it as “a plate of fish and beans”. I mean, this is supposed to be an “American grille”, not a taqueria. All and all, outside of spending some quality conversation with our friends, our meal was pretty forgettable. Nothing really stood out in regards to the food, and while the prices were rather reasonable (our two entrees combined cost us $31), everything was just average. We’re hoping that Jake’s will improve with age as it’s a great space in a location begging for business, but until the kitchen improves, we’ll probably just stick to happy hour visits in the interim. Jake’s American Grille is located on 5018 Connecticut Ave in the Van Ness neighborhood of DC.